Jack Abramoff in 2004. He's the one on the right. "They were fighting to stay out of the tax bill that year, which would have retroactively taxed them to the tune of about $4 billion," Abramoff says. At the time, Sen. Charles Grassley, a Republican from Iowa, had introduced a bill with a provision that targeted companies like Tyco, which maintained an off-shore tax status. The provision would have imposed new taxes on Tyco going back to 1997. So Abramoff and his team targeted the sponsor, Grassley. "What we did was we plied him with contributions," Abramoff says. Abramoff got everyone he could to make donations to Grassley's re-election campaign. Abramoff himself made contributions, as did other people at his firm, as well as executives and employees at Tyco. But there are limits to how much each individual can give, so Abramoff had to expand the circle of people willing to donate. He went to his other corporate clients and asked them for donations as well. Access is vital in lobbying. If you can't get in your door, you can't make your case. Here we had a hostile senator, whose staff was hostile. And we had to get in. So that's the lobbyist safecracker method, is raise money and become a big donor. Abramoff forwarded me some emails that were written around this time. They suggest the safecracking allowed his firm to get in the door. One email to Abramoff from one of his head lobbyists starts, "I ran this morning with Senator Grassley and had breakfast with two staffers and his wife at his house ... looks like I'll be doing it every Wednesday morning." In another email, the woman in charge of raising money for Grassley's re-election writes to Abramoff's lobbyist to ask about an event Abramoff's firm is holding to raise money for Grassley. She asks, "What do you think would be a realistic number?" Translation: How much money will the fundraiser generate? Answer: $30,000. It's hard to figure out exactly how much Abramoff, his firm and his clients raised for Grassley. Somewhere between $50,000 and $100,000 seems like a safe range. Ultimately, the provision that Tyco was concerned about was removed from the bill — not by Grassley, but by Republicans in the House of Representatives. That's according to Kolan Davis, who was the Republican staff director of the Senate Finance Committee at the time this bill was passed. Grassley was chairman of that committee. After the house removed the Tyco provision the first time, Grassley tried to put it back in. Then the House took it out again. Grassley, in other words, doesn't behave like a man whose mind was changed by lobbying. But Abramoff says he didn't need to change Grassley's mind. He just needed to take the fight out of him a little bit. Honestly, it's impossible to know whom to believe: the convicted felon, or the senator trying to distance himself as much as possible from the convicted felon. But this is what I can say: What Abramoff and his emails describe is absolutely legal and absolutely routine. Every day in Washington, lobbyists who want something from lawmakers are rounding up checks for them. At every meal of every day, lawmakers who desperately need those checks to get re-elected are meeting with the lobbyists to take their money. What Abramoff describes is not an aberration. It's not even unusual. It is simply the way the system works. Now, as Congress debates big issues like that, lobbyists for corporations also play a big role, and disgraced lobbyist Jack Abramoff is offering explanations for how it's done. He's out of prison. He has a new book, and he told Planet Money's Alex Blumberg about things he did that were legal. ALEX BLUMBERG, BYLINE: The firm Abramoff worked for was called Greenberg Traurig. I chose a year at random when Abramoff was working there, and picked a client who I hoped would be fairly typical - not one of the Indian tribes that were at the center of the scandal, but a multinational corporation: Tyco International. In 2003, they gave Abramoff's firm $1.3 million. What were they hoping to get for that money? JACK ABRAMOFF: They were fighting to stay out of the tax bill that year, which would have retroactively taxed them to the tune of about $4 billion. BLUMBERG: Tyco, you may remember, at this time, was just coming out of a big scandal involving their CEO, Dennis Kozlowski. And Senator Charles Grassley, a Republican from Iowa, had introduced a bill with a provision that targeted companies, like Tyco, who maintained an off-shore tax status. The provision would have imposed new taxes on Tyco going back to 1997. So Abramoff and his team targeted the bill's sponsor, Charles Grassley. ABRAMOFF: What we did was we plied him with contributions. BLUMBERG: Abramoff got everyone he could to make donations to Grassley's reelection campaign. Abramoff himself donated, as did other people at his firm, executives and employees at Tyco did. But there are limits to how much each individual can give. Abramoff had to expand the circle of people willing to donate. Fortunately, Tyco was just one of many clients that Abramoff's firm represented. ABRAMOFF: I went to every client I could and rounded up every check we could for him. Look, access is vital in lobbying. If you can't get in the door, you can't make your case. Here we had a hostile senator, whose staff was hostile, and we had to get in. So that's the sort of lobbyist safecracker method, is raise money and become a big donor. 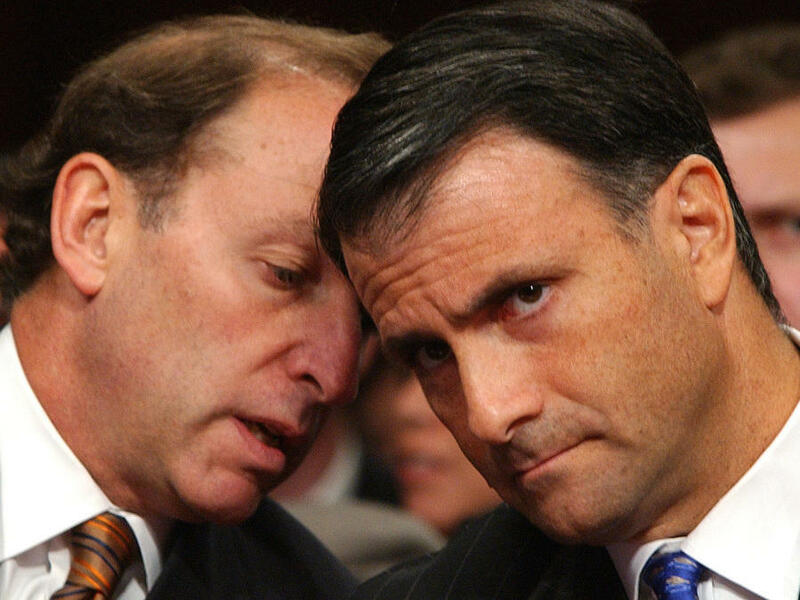 BLUMBERG: Perhaps you're wondering: How much can I trust a convicted felon like Jack Abramoff? Well, he's a convicted felon with a lot of old emails in his inbox, some of which he forwarded to me from around this time. And they suggest the safecracking worked. One email to Abramoff from one of his head lobbyist starts, quote: "I ran this morning with Senator Grassley and had breakfast with two staffers and his wife at his house." He goes on, quote: "Looks like I'll be doing it every Wednesday morning." In another email, the woman in charge of raising money for Grassley's reelection campaign, who's on Grassley's campaign staff, writes to Abramoff's lobbyist to ask about an event Abramoff's firm is holding to raise money for Senator Grassley. She asks, quote: "What do you think would be a realistic number?" Meaning, how much can you raise? The answer: 30 grand. Overall, it's hard to figure out exactly how much Abramoff, his firm and his clients raised for Charles Grassley, somewhere between 50 and $100,000 seems like a safe range. And, in fact, the provision that Tyco was concerned about was removed. But here's the question: Was it removed by Charles Grassley? KOLAN DAVIS: I'm Kolan Davis. During the 2003-4 period, I was the Republican staff director/chief counsel of the Senate Finance Committee. BLUMBERG: A committee Grassley chaired. Grassley's office, understandably, was not eager to be mentioned in a story with the man who has come to symbolize corruption in Washington - especially since, they say, Grassley wasn't the one who removed the Tyco provision. The House did it. Their version of the bill kept that provision out. DAVIS: Both sides have to support it, and the House voted it down. BLUMBERG: So the lobbying efforts, all those lobbying efforts that Jack Abramoff went through, what you're telling me is essentially that was just wasted time and money? DAVIS: I think the facts bear that out. BLUMBERG: The facts Davis refers to are these: After the House removed the Tyco provision the first time, Grassley tried to put it back in. The House voted to take it out again. Grassley, in other words, did not behave like a man whose mind was changed by lobbying. But Abramoff says he didn't need to change Grassley's mind. He just needed to take the fight out of him. Honestly, it's impossible to know who to believe: the convicted felon, or the senator trying to distance himself from the convicted felon. But this is what I can say: what Abramoff and his emails describe is absolutely legal and absolutely routine. Every day in Washington, lobbyists who want something from lawmakers are rounding up checks for them. At every meal of every day, lawmakers who desperately need those checks to get reelected are meeting with the lobbyists to accept the checks. What Abramoff describes is not an aberration, not even unusual. It's simply the way the system works. Alex Blumberg, NPR News. Transcript provided by NPR, Copyright NPR.